For Matthew Sweet's latest album, he has pretty much gone the one man band route, playing most instruments on the album himself. 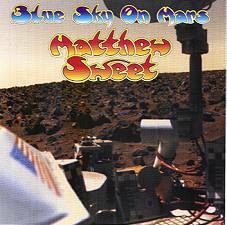 This gives Blue Sky On Mars an even poppier sound than past albums. Re-upping with producer Brendan O'Brien (Pearl Jam, Stone Temple Pilots, Neil Young) from Sweet's last album, it does sound terrific, with songs like the terrific Cheap Trick-circa-1979 single "Where You Get Love" or the melancholy rocker "Hollow."